Nestled into the Pines and Poplars on a majestic island, this lodge offers all the amenities you can think of to enjoy your fully guided American Plan trip. This 5 acre modern outpost camp is set on peninsula with two long sand beaches. It is a beautiful setting and a special place for a lot of our outpost guests. Over 22 miles of fishing mayhem! Fast moving water on both lakes for massive Pike and Walleye. Our 2018 season got off to a hot start in late May and did not slow down! Our Master Angler Northern count was way up this year and the Walleye fishing has been tremendous as well. Our guest satisfaction is as high as it’s ever been, as you will see from the testimonials. We have had a record number of first time Master Anglers this year at Silsby. One new guest caught his first ever Master Angler on the first day with his first cast! This size of the fish this year has also been impressive. 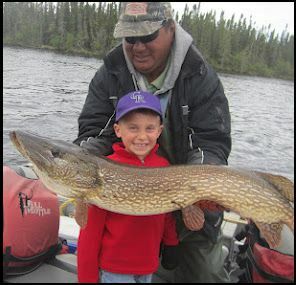 Both the Pike and Walleye are as healthy as they have ever been, a great sign for the future of this fishery. With big shoulders, broad backs, and huge girths these fish are giving our guests a run for their money after setting the hook. With the improvements we have been making around the camp, the fantastic fishing, and and most importantly happy guests we couldn’t be happier with how the this season has gone. We are taking a lot of 2019 reservations, already, so check out the 2019 schedule and reserve your date today! "Sam & Stacey, We can't thank you enough for such a wonderful few days at your fishing camp. My kids LOVED it and can't wait to come back. Your staff did such a great job with all of the kids -- as witnessed by the attached picture of Cody (7 years old) and the huge smile on his face. Thanks again."